The Corvidae family includes crows, jays, ravens and magpies. The colorful plumage of jays makes identification easy. Most of the Corvidae family have black feathers, or a mix of black, white and maybe blue. Your location in the world may help you tell a crow from a magpie. In the United States, crows and magpies have distinctive features which make identification easier, though both species prefer living in trees in open woodland areas. Crows and ravens are in the genus Corvus. Three crow species live in the United States: the American crow (Corvus brachyrhynchos), Northwestern crow (Corvus caurinus) and fish crow (Corvus ossifragus). The American crow can be found in most states. The Northwestern crow, a smaller bird, resides along the northern Pacific coast of Washington state. Fish crows look identical to American crows and are found along the eastern and southern coastlines. Two species of magpies reside in the continental U.S. The black-billed magpie (Pica hudsonia) inhabits the northwestern regions of the country. These birds have long tails, black-and-white bodies, and blue-tinged wings. Think of them as an amalgam of a jay and a crow. The yellow-billed magpie (Pica nuttalli) looks much the same except for the beak color. The range of Pica nuttalli is limited to parts of California. Magpies and crows differ in body length, wingspan and weight. The Cornell Lab of Ornithology notes black-billed magpies measure anywhere from 17 to 23 inches in length, due to the long tail. Their wingspan is 22 to 24 inches and their weight ranges from 5 to 7 ounces. The American crow's shorter tail corresponds to a shorter body length of 16 to 21 inches. The crow's wingspan ranges from 34 to 39 inches; weight falls between 11 ounces to over 1 pound. Researchers tracked the dispersal of the Corvidae family using DNA sequencing. An article in "The Journal of Avian Biology" notes the Corvidae probably resided "on the Australo-Papuan tectonic plate when this split from Antarctica." The birds spread into southeast Asia, today home to magpies and treepies. New World jays, which we see in the United States, apparently migrated to the area over the "trans-Beringian route." 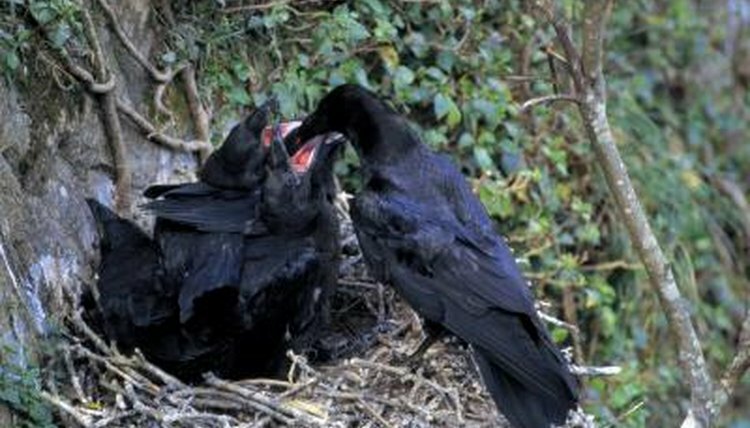 Crows and ravens, Old World family members, went to Europe, and from there spread to most temperate areas of the world. Do All Turkey Hens Have Beards?